Gothsu is a South Indian accompaniment for idli, dosa and pongal. It is either made with kathirkkai (brinjal) or onion-tomato. Gothsu is quite similar to sambar. The difference is that gothsu contains less amount of dal and moong dal is used instead of toor dal. Today, we will see how to make onion tomato gothsu. 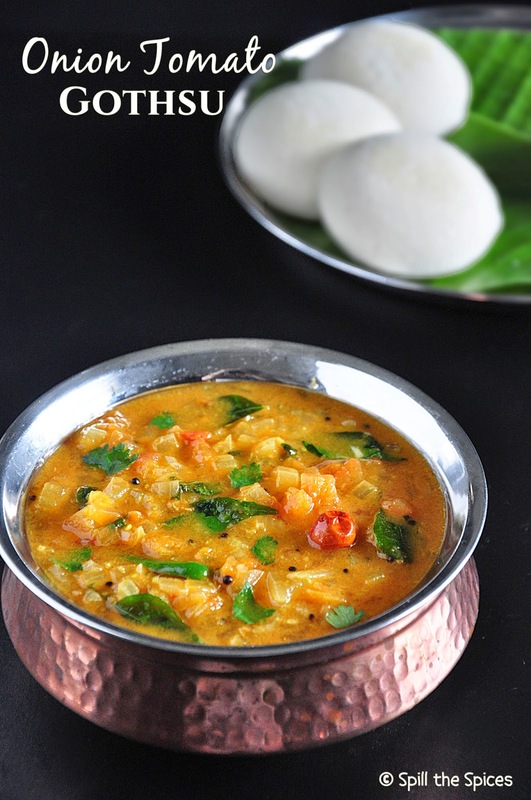 Onion tomato gothsu is a simple and easy side dish for idli, dosa, pongal and even upma. This gothsu can be prepared in very less time. I personally prefer gothsu over tiffin sambar. I love the sour taste with the slight hint of sweetness from the jaggery. 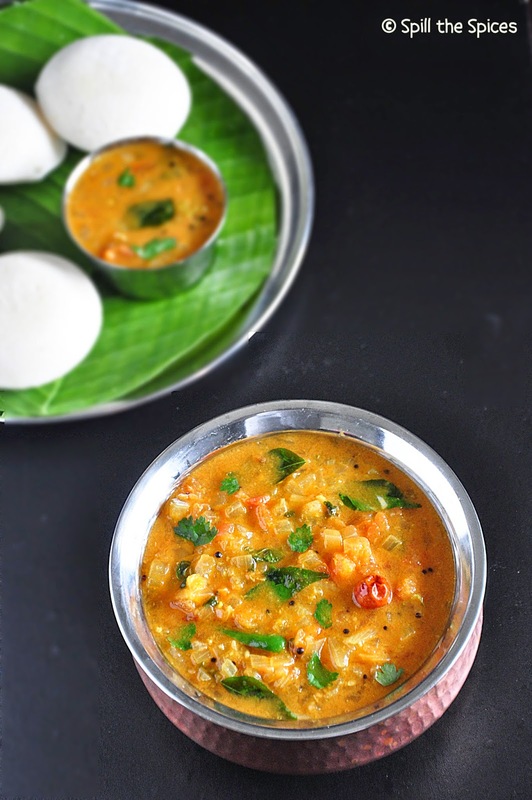 Try this gothsu for idli or dosa and I'm sure you will fall in love with the flavors. 1. Heat oil and add mustard seeds. When it splutters, add red chillies and curry leaves. Then add onion, green chiilies and saute till onions are soft. 2. Then add tomatoes and cook till they become soft. Add turmeric powder, red chilly powder, sambar powder, salt and 1 cup water. 3. Mix well and bring to boil. Simmer in low heat for 5 minutes. Then add the cooked dal and more water if its too thick. 4. Let it simmer for another 3-4 minutes. Lastly added coriander leaves and jaggery. Simmer for another minute and remove from heat. Gothsu has a thin watery consistency. So if its thick, add water and adjust it. If your tomatoes are not sour, add 1 or 2 tsp of tamarind paste. looks so colorful and tempting. Tempting and delicious curry !! Nice presentation. Gothsu looks delicious. 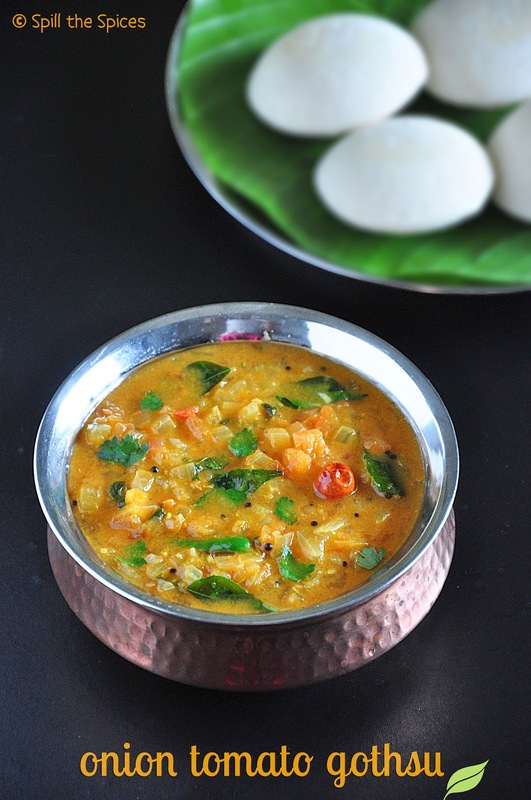 Delicious and mouthwatering gothsu, perfect side dish for idli and pongal. nice tempting clicks.. Really mouthwatering gosthu..
Looks so good with the idlis, I also love this with pongal..
lovely clicks n tempting gosthu..
Looks really fantastic & mouth watering.. great clicks dear..
Gothsu looks delicious.. nice pics..
My makes this often for idli. Thanks for sharing,looks delicious. Fingerlicking gothsu, who can resist to this mouthwatering dish.